You Want Features? We Got Features! Welcome, we have detected that you are from the United States. Did you know RealSatisfied is available in the United States? Now you can choose which site you would like to use. Did we get your location wrong? Sorry about that! I'm from Australia, I'd like to stay here. Remember, you may always change country sites by clicking the flag at the top of the page. Take RealSatisfied for a test drive - We'll send you an invitation to complete the survey of your choice for a fictional agent at our test drive agency, Happy Valley Real Estate. If you complete the survey we'll send you a sample version of the survey report that is delivered to you on completion of any of our surveys. We think it's a great way to have a look at RealSatisfied - why not take us for a Test Drive and see why! *completely optional, we'll only contact you regarding this test drive if you don't check here. Our sales staff will be happy to contact you to discuss RealSatisfied. Just complete a few details below and we'll be in touch. eg: what time would you prefer a call. or ask our helpdesk for support. Many of the most common questions asked in our helpdesk can be answered in our online Agent Tutorial. Why is my survey response Quarantined? How do I access my Agent Dashboard? How do I approve & publish a Testimonial? You may also wish to review our General FAQ. Not able to find and answer? Need help? Please note we only offer support online. Brokers: RealSatisfied is designed to provide you with the tools to simply and effectively manage the process and the results. We make it easy to see how you, your office, or your company is performing. Our in-depth reporting tools provide valuable insights completed surveys, including summary reports, office performance, factors of influence, marketing sources and more. All are just a click away on your dashboard. Our robust API allows us to integrate with almost any technology counterpart. From transaction platforms, websites, to CRMs our goal is to make sending survey invitations and receiving survey results seamless to your workflow. We provide a sandbox for testing and our API is open for your review. Click here to learn more: Developers & API. We’ve seen measurable improvement in our customer satisfaction numbers since starting with RealSatisfied. This fact simply proves the maxim; things that get measured, get managed. Agents: RealSatisfied provides you with the tools you need to get the most from their client feedback and testimonials. With the magic of RSS, a WordPress plugin, and widgets, you can easily publish and display your testimonials and recommendations where you see fit. Every agent on our customer satisfaction has their own unique RSS feed associated with their results and have full control over what gets shared to the feed. Social media recommendations are powerful. 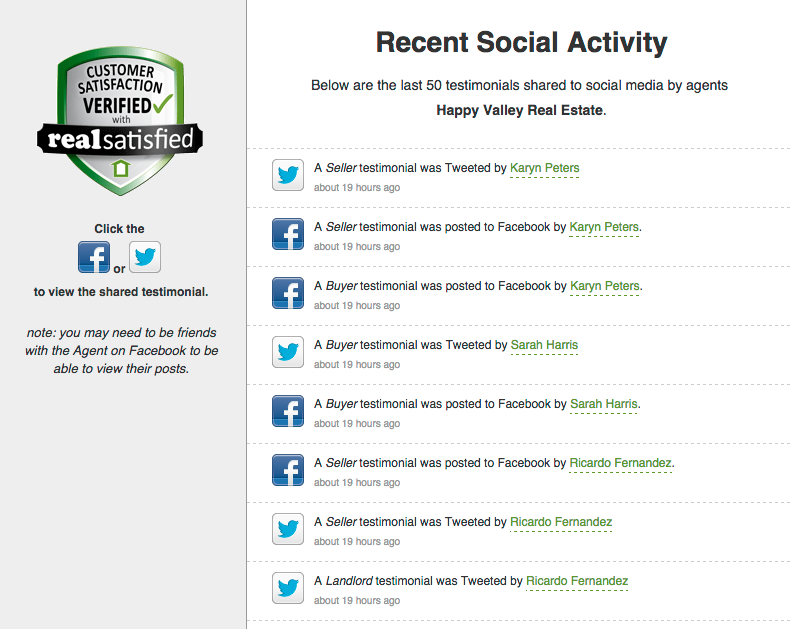 We make publishing your Success Stories to social media easy using what we call, "Visual Testimonials", Simply connect from your RealSatisfied Agent Profile Page to your social profiles. 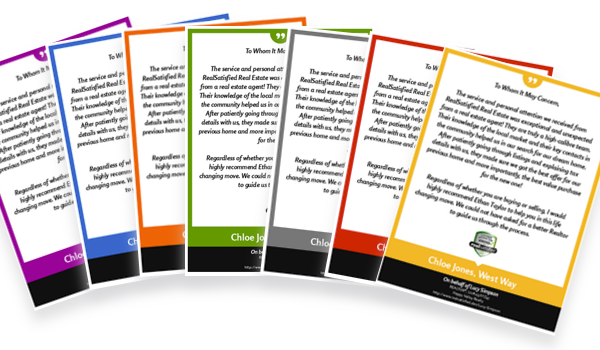 When you receive a new testimonial we turn it into a graphic perfect for sharing. Then you decide when and where to share it. We believe the data we collect on your behalf is your data. And we, like you, believe your testimonials belong in as many places as possible. We go out of our way to ensure that your data is accessible to you and any partners willing to work with our validated information. We are working on new integrations continuously. Customers are twice as likely to talk about a bad experience as a good experience. Understanding your client’s real estate experience with you, your agents, or your office, is the first step toward correcting and improving weak areas. Our Complaint Escalation Process automatically alerts you to customers who may have had a problematic experience. 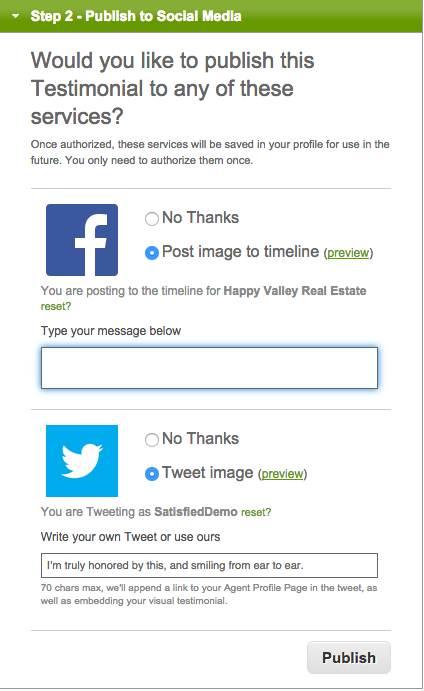 One of our most raved about features is how "simple and easy" it is to send our surveys. Our automated system will invite your clients to take the survey, notify you that you have received one, and provide a fun way for you to thank them in the process. I’m pretty sure that RealSatisfied is the best product we have ever launched. Universal approval across an enormously diverse agent base.